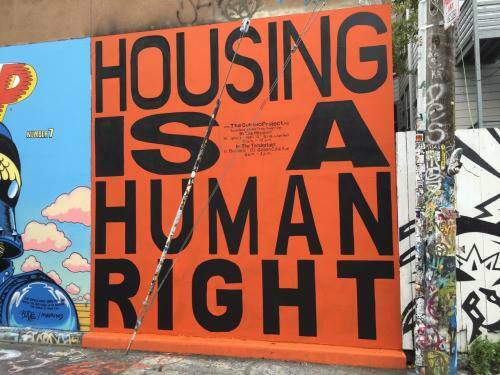 A network of over 60 grassroots organizations in racially and economically diverse areas across California have formed Californians for Affordable Housing (CAH) to reject the Governor Brown’s housing plan “Trailer Bill 707” (a.k.a. “By-right”). This housing plan would enable for-profit developers to obtain approvals of mostly market rate housing projects “by right” without public or environmental review. You can follow the conversation at #ByRight4Whom and follow us on Facebook at www.facebook.com/opposebyright and on Twitter @opposebyright. This is not about affordable housing. Brown’s proposal does not address California’s real barriers to producing affordable housing. The proposal fails to address the need for dedicated affordable housing funding, the priorities of disadvantaged communities, or exclusionary zoning – the most fundamental affordable housing and displacement issues. Increases displacement. A policy that enables “by-right” simply deregulates market rate housing development which has proven in all of California’s major urban areas to cause displacement of lower income communities. We believe in a California that is home to people of all economic, social, and ethnic backgrounds. Erodes existing protections. “This plan has the potential to undermine rent control protections by expediting demolition of existing housing without public input. With 5 California cities going the ballot this November to establish rent control protections, we won’t stand by and let Governor Brown undo our work. Strips away citizen input. Democracy is not a barrier for development. Exclusionary local zoning regulations - not community participation - keeps affordable apartment homes from being built. Participation has proven to result in greater affordable housing, lesser environmental impacts, retention of small businesses and a stable, diverse economic base. The organizations who are a part of CAH formed by signing on to an opposition letter here. To add your voice to defend the right of communities to require real estate developers to protect tenants, jobs, small businesses, and the environment, complete the form to the right and click “START WRITING”. A sample letter will pop up that you can edit and send via email. Write to protect your rights today!